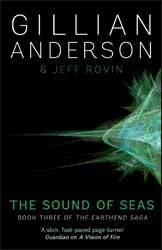 So the final book of The Earthend Saga trilogy comes to a close with The Sound of Seas, written by Gillian Anderson (writ large on the cover) and Jeff Rovin (writ much smaller and darker so as to fade against Anderson's monolithic name). If you have yet to read the first two books, A Vision of Fire and A Dream of Ice, there are the remains of a lost civilisation hidden beneath the Antarctic ice. By accident, Caitlin O’Hara is able to access Galdkhaani tiles, using them to travel into the past to the civilisation of Galdkhaani, just prior to its destruction in an effort to have its citizens ascend to a higher plane. However the destruction in the past threatens the present, so its handy that various characters can pop back and forth between the time zones. There is a B plot regarding the decedents of the lost civilisation, but much of this is logically confusing. The Sound of Seas (2016. 277 pages) provides more of a race compared to the first two novels, mostly because the whole, or at least the greater majority, of the plot has to be resolved in quite a short book. Regardless which of the authors had the lion’s share of the writing, the overall sense you get from the trilogy is one of a story which sounded good on paper (no pun intended) but when pulled apart started to feel very thin. Attentive readers are more likely to get to the end of the book confused about many plot lines which are not resolved and story plot hole which have just been left. And that is ok. I don’t think the book tries to be anything other than an entertaining romp, an adventure where your supposed to enjoy the overall experience, rather than delve into the minutia of the plot. In the end, the whole trilogy could have done with some judicious editing into one story, leaving time to tie up all of the stories glaring inconsistencies.